When I turned my R&M 3704 off I heard the crackling sound of electricity arcing, and when I turned the fan on again the sound stopped. Upon investigation, I discovered that the switch lever had worn through the friction tape on the windings and shorted out with the magnet wire. Now I am trying to decide whether to rewind it or try to save the original coil. The cloth insulation on the magnet wire is charred, but still intact, and the fan still works on all three speeds. Any Ideas? strips of 3M Scotch 27 Fiberglass thermoset tape on the area of the windings where the arm rubs. Product Description 500-15074 This item features: -Is a woven glass cloth tape designed to operate in 600-volt dry applications, requiring high mechanical strength and resistance to high temperatures. -The glass cloth is specially treated and prepared to provide corrosion-free protection. -It will not shrink, rot, or burn and has a high tensile strength. -Contains pressure-sensitive thermosetting adhesive which performs as Class B temperature (266 F / 130 C). -Provides hear stable insulation for hot spot applications. -Color: White. -Length: 66 ft. -Thickness: 7 mil. -Tensile Strength (2): 150 lb/in. -Material: Glass Cloth. 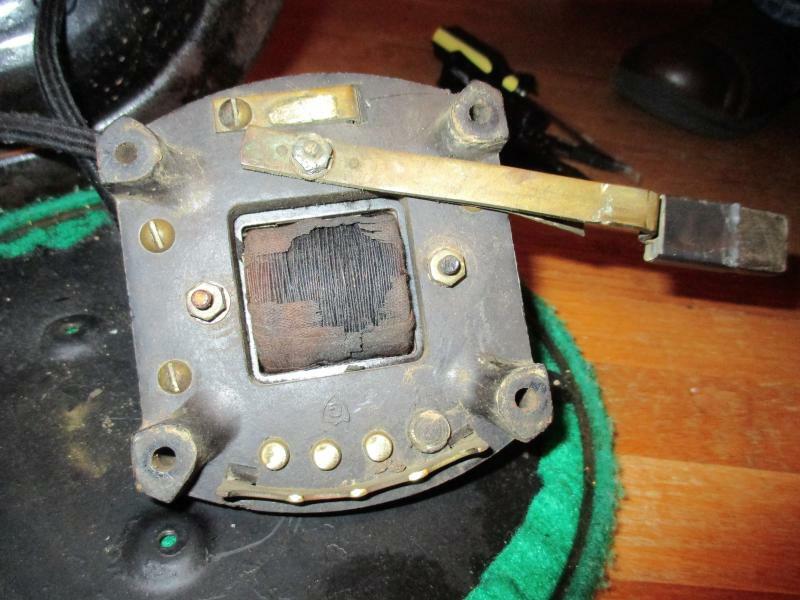 Actually I'm thinking what happened with your fan's speed coil was that the tape just deteriorated after 80+ years and just crumbled off, as there's plenty of space between the bottom of the speed coil and the switch lever so there's really no way for the switch lever to touch the bottom of the speed coil assembly. As to what the electrical arcing noise was it was probably more than likely just some arcing between the speed coil wiring going to the switch because of some metallic dust particles of some sort that had bridged between the wire connections. And the darkened insulation on the speed coil windings that are exposed is more than likely darkened insulation varnish that had gotten discolored over the years from exposure to the friction tape adhesive that was on there. And with that in mind and the fact that you said that the speed coil still works with all three speeds I'd say your fan's speed coil is fine and what you might want to do though is remove the rest of the old friction tape that was wrapped around the speed coil assembly and then get some spray on insulation varnish and revarnish the speed coil windings and you should be set for another 80+ years of fanning with your fan. Page processed in 0.2039 seconds (39% database + 61% PHP). 28 queries executed.